As a keen and professional observer of the modern consumer electronics market, I can say without fear of contradiction that smartphone screens are getting bigger. So can columnist Alex Barredo, but he's done an impressive amount a statistical legwork and presentation to prove it. On the surface his analysis of smartphone size screen trends may seem obvious, but within you can find dramatic shifts in patterns of both the overall market and specific companies. It's worth a read if you're interested in trends and device design. 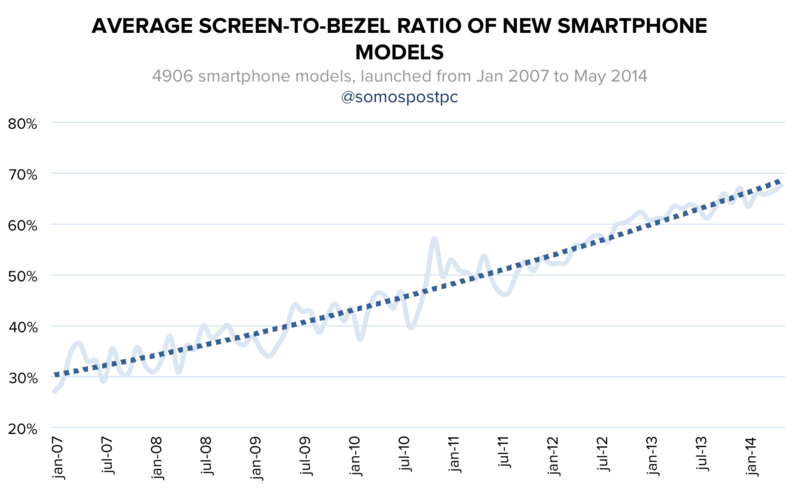 First of all, smartphones in general and phone screens in particular have been on an upward slope ever since the release of the original iPhone seven years ago. 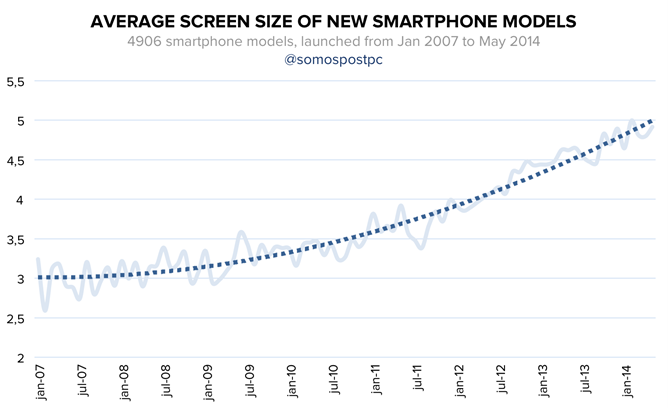 That shouldn't come as a surprise to anyone, but screen sizes have also been rising more rapidly in the last two years alone. 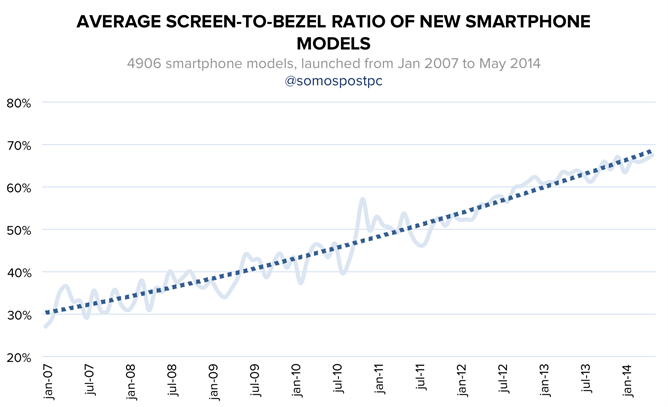 As Barredo notes in his article, the average screen size rose from 3" diagonal to 4" from '07 to '12, but from 4" to 5" between '12 and '14. 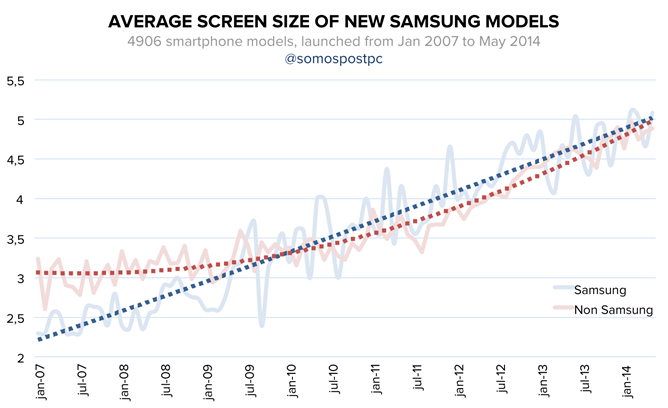 At this point, 80% of the smartphones being introduced have screen sizes larger than 4.5", which is pretty amazing, considering that the HTC HD2 (4.3") was considered "gigantic" when it launched in 2009, and so was the original Galaxy Note (5.2") when it was released in 2011. You can probably guess who's driving the trend. Samsung seems to have opened the floodgates for oversized phones with the Note series, and they continue to push screen sizes ever higher. But their competitors are catching up - the latest flagship phones from HTC and LG are as big or bigger than the Galaxy S5, and phones designed to compete with the Note series (the HTC One Max and LG's G Pro and G Pro 2) have even bigger screens. Samsung's own Galaxy S5, at 5.1", is just barely smaller than the original and "enormous" Galaxy Note. At this point, the industry average is almost neck and neck with Samsung. Apple, notably, is sticking to its small-screen guns, though rumors of a dramatically larger option with the next iPhone generation persist. 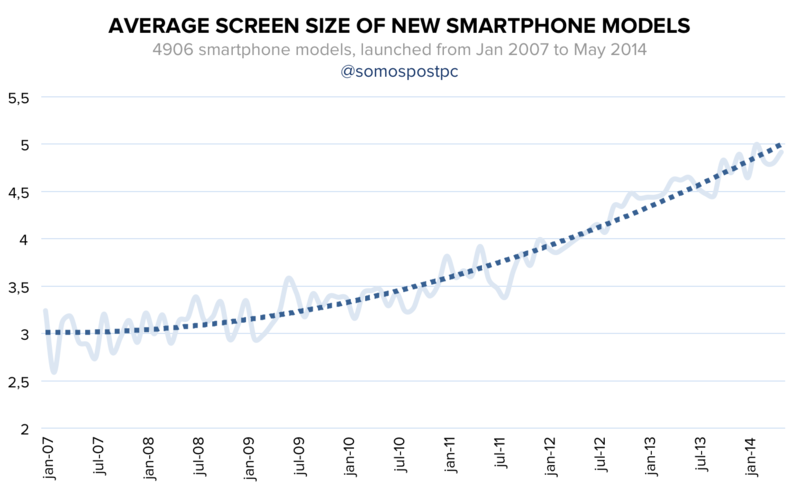 Screen size alone isn't the only factor to consider when commenting on the rise in phone sizes. Bigger screens enable hardware designers to include bigger batteries, and better component miniaturization and smaller screen bezels means that a 5" phone released today can be considerably smaller in footprint and volume than one released two years ago, and thus, much easier to use with a single hand. As someone who prefers a phone small enough to use with one hand, the trend towards giant phones designed to be used in both is mildly upsetting. You can certainly find smaller phones at the moment (I think the Moto X, at 4.7" with an impressively ergonomic case design, is probably the best available). But these phones tend to be on the budget side of things, considered a "step down" from flagship models with prices to match - see the HTC One Mini 2, with a 4.5" screen that's only "mini" compared to the 5" One M8. 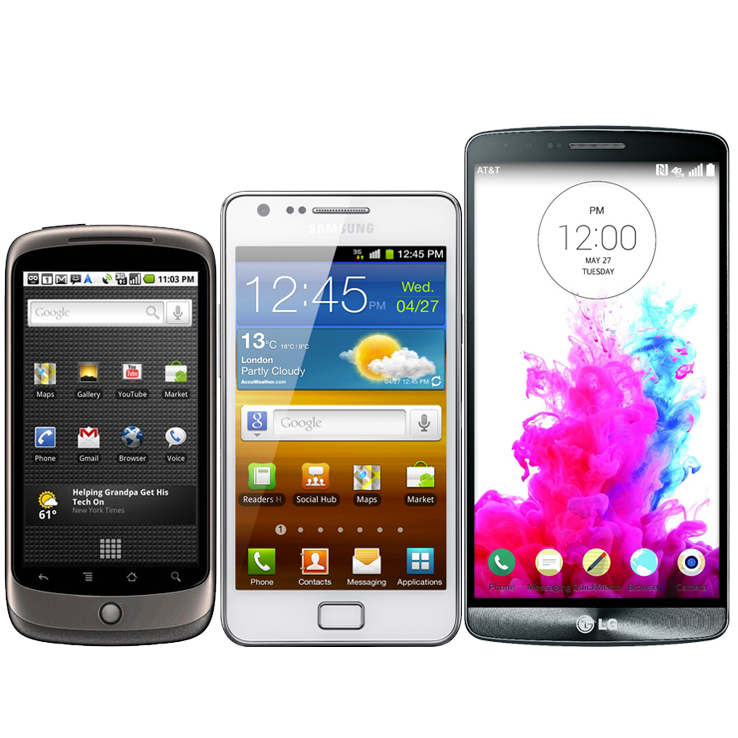 Other manufacturers like Samsung, LG, and Motorola also have their "mini" phones, mostly with lowered specs, at about the same size. If the trend continues, it will be very difficult to find a high-powered smartphone that isn't visible from orbit in a few years. I might be in the minority here - in fact I certainly am, if the trends in phone design accurately reflect consumer tastes - but I'm consoled by the fact that mobile hardware is getting so powerful and efficient that even a "budget" phone released today is much better than the most expensive devices released a few years ago. And hey, if you want something more reasonably-sized, there's always the iPhone. Read Barredo's full report for some great data and analysis. Now please excuse me, I need to go find a hideout.